A recent survey found that Austin has the 2nd best economy in the United States, only beat out by Provo, Utah, the Austin Business Journal reports. 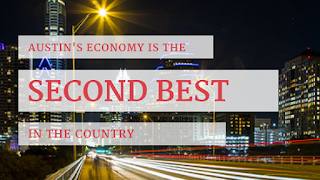 Austin had been number one for the past two years. The cities are ranked using numbers from the U.S. Bureau of Economic Analysis, U.S. Bureau of Labor Statistics, and the U.S. Census Bureau. Austin added 275,000 new people to the city in the past half decade, which is a 15.5 population increase. 2,900 jobs were added in the private sector each month since 2012, which is a growth rate of 26 percent. Need help finding a new apartment in Austin’s competitive rental market? Apartment Specialists South Austin can help! Give us a call today at 512-912-8000! Could Austin Get the New Amazon Headquarters?